Only four ingredients go into these easy turkey sticks! Nova loved exploring a new food and feeding herself this wholesome, simple dinner. 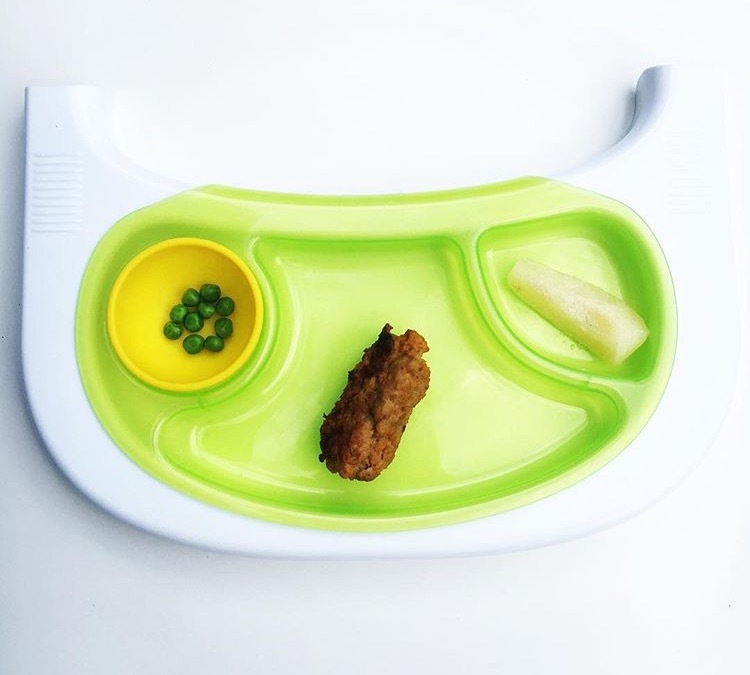 They are great for Baby Led Weaning because your little one can grip the turkey for self feeding and the texture is easy to nibble on. 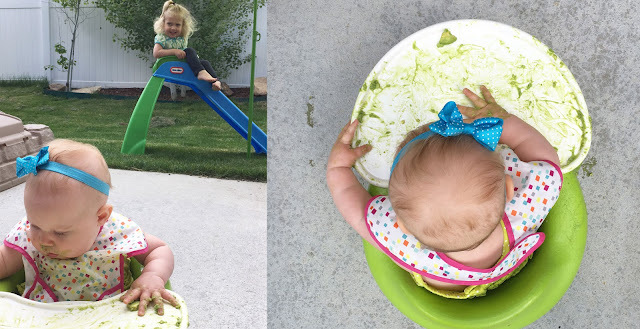 If you want to try Baby Led Weaning, but find it a little nerve-wracking this would be a great recipe to try! Mix ingredients together with hands and form into log shapes. Brown on all sides in an oiled cast iron pan. Bake at 350° for 20 minutes. I used canned pumpkin puree from the baking aisle. If you can’t find pumpkin you can substitute baked and mashed acorn squash, or you can even try a jar of butternut squash baby food puree. It’s fun to experiment with different ideas! My idea for this recipe was inspired by meatballs. The pumpkin holds the ingredients together as eggs would, and the oatmeal gives the turkey a light texture. When mixing ingredients together, you will be able to feel if you need to add a sprinkle of oatmeal or an extra dollop of pumpkin. I made a batch of Turkey Sticks and used a flash freezing technique to store for quick meals. This process, a.k.a. freezer cooking, takes a lot of stress out of our dinner routine. I love being able to cook once, and freeze several portions. Not only does freezer cooking save me time, but it also saves me from throwing away leftovers that got too old. To flash freeze, line a baking sheet or cutting board with wax paper. Place the turkey sticks on the sheet, spaced out so they are not touching each other. Freeze several hours until frozen solid then store in a zipper freezer bag. To defrost, simply warm with your microwave or toaster oven. When I defrosted the Turkey Sticks for dinner a few days later, I served them with steamed asparagus and diced cherries. Another time, I served the sticks with a side of peas and pears for Nova, and Josie had a side of tortellini. Thank goodness I had my Bumkins Splat Mat ready to catch all of the mess! Josie (2.5 years old) is learning to keep her food on her plate, but the Splat Mat saves me a lot of sweeping and mopping after Nova’s meals. I lay it down under her chair before her meal then I shake the crumbs into the sink before tossing in the washing machine. It’s like a giant bib for the floor! Sometimes I even sit these sweet sisters next to each other and they both fit under the Splat Mat. They are too cute sharing their meals! Coffee is where it all started. One morning, I sleepily realized that showing my baby how to push the “on” button on the espresso machine would be like pushing a button on a toy truck or an elevator, but so much more productive and exciting for both of us. Brilliant. Oliver got to push a button and get hugs, kisses, and thank yous from me while listening to the loud buzz-hum of the machine and watching the mysterious dark liquid drip into a cup…all while being held by me, bursting with pride. I wondered if, on a subconscious level, he was ever curious about what was in the daily beverage that would transform his weary, sleep-deprived mom into a more cheerful, more engaged, temporarily less-exhausted version of herself. Our mini-barista became indispensable to the morning routine. (One of his very first sentences was instructing his dad to “Make Mama latte.”) Soon, he was hanging out and watching me cook with keen interest. He got to stir the batter for pancakes, mash bananas for banana bread, and mix spoonfuls of applesauce into plain yogurt. I was on a mission to raise a child who was comfortable in the kitchen. Before my son was born, I had gone back to school to study nutrition and then after his birth, had taken a break from my graduate program to be with him full-time. I reasoned that role-modeling positive eating behaviors (veggies – yum!) and introducing my child to the process of planning meals, shopping, and cooking would benefit him from a life skills perspective and a nutritional one. Plus, it would be a great way to test out those theories about shaping healthy eating behaviors that I had learned in school. Our baby quickly grew into a toddler who was eager to explore the many things he could do all by himself. All day long, Oliver and I had negotiations about things he could do with help or without help (or his least favorite category: oh no, never never never, you have to help me keep you safe and be helpful, please!). I knew it was my job to give him limits and it was his job to test those limits, but…it was going to take more than just a latte to get through that phase. Having playdates in the kitchen was a great place for us to practice working together by doing simple and safe food prep tasks. Of course, when he was just a year old, he couldn’t do anything in the kitchen by himself. Often, when we started a task, I would say “you start, I’ll finish,” or “I’ll start, you finish.” Either way, we were getting the job done together. As he matured into an older toddler, he could do a little more and I could do a little less. Finally, he was able to do more and more things completely on his own. Sprinkling shredded cheese on a tortilla for a quesadilla, beating eggs, adding ingredients to a bowl of pasta, and putting a slice of turkey on a sandwich were things that he could do with a little help. Eventually, he learned to pour milk from a small cup into a bowl of dry cereal; it was kind of cool to have a toddler who could “make” his own breakfast. He was very proud of himself each time he mastered a new skill in the kitchen, which happened more and more quickly. Spending time together in the kitchen became a family tradition, so it was natural to let our second and third sons help out too. 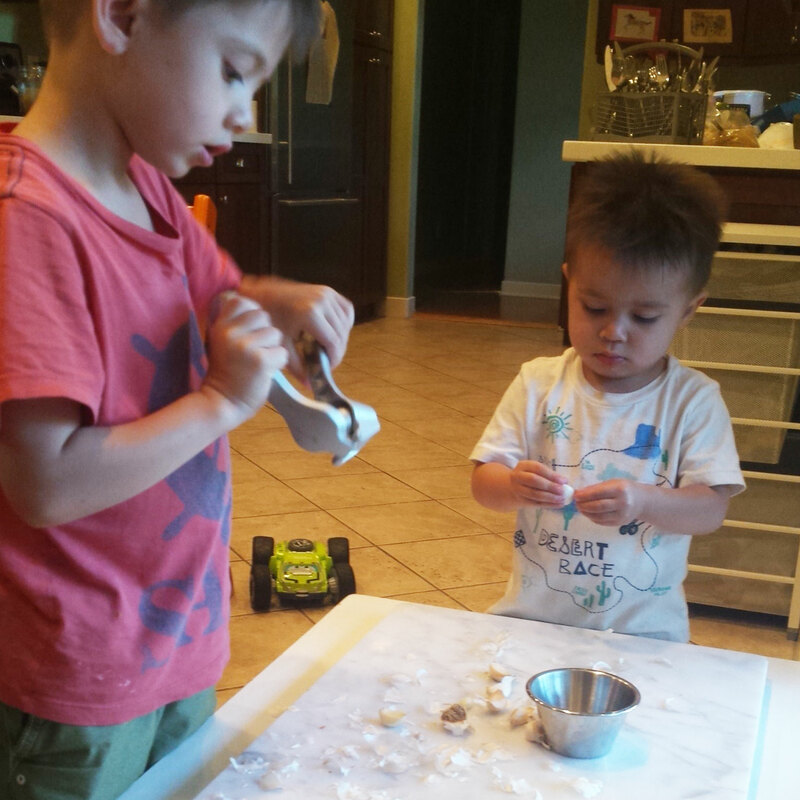 I credit these early kitchen playdates with getting each of them off to a good start as happy, healthy eaters. Each of them went through a “picky eating” phase (the researchers call it “neophobia”, or the fear of new foods). But I am confident that their cooking experiences gave them exposure to foods in ways that helped to minimize their neophobia. Cooking with your child can be an adventure, a gift, a chance to learn; it can be an opportunity for science education, math practice, language development, and learning to work as a team. Best of all, kitchen playdates can be about creating happy memories in addition to delicious and nutritious food for the family. She helped me pick out the plates, napkins, straws and candle from our favorite local party store, Petite Party Studio, and the canisters for the donut holes from Michael’s. We ordered invitations and a banner from Etsy. I wanted to include her in the planning because she definitely has her own ideas about how things should be, but I wanted to have a few surprises, too. Pumpkin didn’t know until the day before the party (her actual birthday when she opened gifts at home) that I ordered her a special shirt to wear. Funny story – remember earlier when I told you she loves birthdays? Well, on her birthday, she woke up at 1:30 in the morning ready to start the day. Luckily, my husband was able to get her back to sleep. Then on the day of the party she woke up and got dressed in her new shirt before ever coming out of her room. She still needed a shower before the party so I had her change pack into pajamas, but we were cracking up because this is something we ask her to do every day before school but she has only ever done it once or twice before – she was just so excited for her party! She knew I would be picking up donuts and donut holes for the party, and serving flavored milks for the kids and cold brew for the grown-ups. She didn’t know that I also ordered chocolate cake (her favorite!) shaped like a donut. It was a hit! I will confess that I’m not a huge fan of party favors because our kids have so much stuff already. (In fact, we usually ask our guests not to bring gifts, although this year Pumpkin requested donations instead.) When we’ve done parties before, the gifts have been edible, and they were this year as well! She picked her favorite patterns of Bumkins’ small snack bags as favors (which I love because they are reusable and machine washable, and she loves because they have her favorite characters). 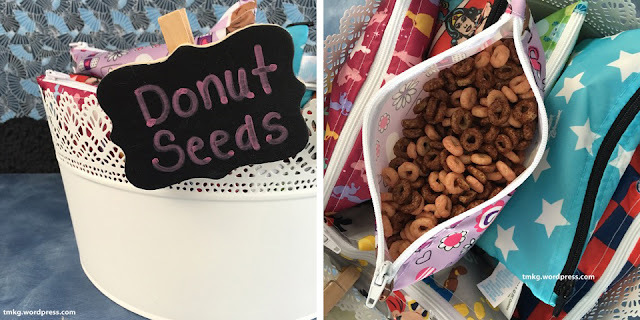 The surprise for Pumpkin was what I put inside – donut seeds! These were simply strawberry and chocolate Cheerios mixed together. We rarely get chocolate cereal (this was actually probably a first in our house since we’ve had kids) so the girls were pretty excited. Pumpkin had a great time at the party painting and playing with her sister and their friends at the museum – and of course, all the sugar involved! If you can’t splurge a little on your birthday, when can you? My oldest was born in Reno, and in her first 18 months she was in a pool exactly once and it was at a resort casino – how’s that for a stereotype? When she turned a year and a half in January of 2013, we signed her up for her first swim lessons at an indoor pool and I remember driving there in the snow thinking what an odd time to be swimming. The timing worked out, though … at the end of March that year, I accepted a job in Phoenix, and we moved back to Arizona (my husband grew up here and I had previously lived here). Now my oldest is 4 and has a 2-year-old sister. Here in the Valley of the Sun, we find ourselves in the pool much more frequently – at our friends’ houses, pool parties at the rec centers, etc. And so many splash pads, too! We also have our girls enrolled in swim lessons every summer to help them learn to be safe around the water. Their lessons are four nights a week, so we always have our poolside essentials ready to go. Sunscreen: This is a must in the summer, and really should be a year-round habit. Our kiddos get slathered every morning before school and every evening before we head to the pool. Swim suits: Sometimes the girls wear traditional swimsuits, sometimes I put them in long-sleeve tops with UV protection. Swim diapers: Our oldest is done with diapers. For our youngest, we love the Bumkins swim diapers that can be worn over and over again. Of course, I love that we are not throwing disposables in the landfill. But let’s be honest – I also love the cute patterns and the fact that they look much nicer under a swimsuit. Water shoes: The girls need slip-proof water shoes both for walking around the pool before and after lessons, and for water day at school. Closed-toe are the safest (and required for school). Towels and cover-ups: To be more efficient during our jam-packed swim-lesson nights, we bring one towel for the parent who goes in the pool and terrycloth robe cover-ups for the girls. Sun hats: We don’t need these for swim lessons, but for a long day at the beach or pool – or anytime in the sun – it’s best to have the added protection. I’m always concerned about the parts in my girls’ hair getting too much sun! Sunglasses: Sunlight can damage the eyes so, like hats, these are also good to keep handy if you’ll be outside for a while. 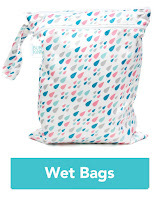 Wet/dry bags: We keep these bags everywhere – the diaper bag, the girls’ backpacks for school – and they get tons of use in the summer. The outer pocket can hold sunscreen, goggles, sunglasses and more, while we use the inside pocket to transport wet clothes home. Goggles: While a parent still goes in the pool with our youngest for swim lessons and she rarely likes to get her head wet, our oldest is a little more advanced and she always wants her goggles on to put her face under the water. Little sis usually demands some after lessons are over to be like her sister. Water: We’ve held steady over 110 degrees for several days in a row now. I offer both girls water frequently and ask them to drink up and refill their bottles at school so they are hydrated before going out to swim in the heat. June is Potty Training Month! The potty training journey is an emotional one for everyone involved. Little ones are eager to become a big kid, but can get frustrated with the process involved. Parents look forward to getting rid of diapers, but it can be a tough realization that you don’t have a little baby anymore. Wet/Dry Bag: Accidents will happen, so it’s best to be prepared. Keep a clean, dry change of clothes handy, and have a place to store the wet, messy clothes with a Wet/Dry Bag. 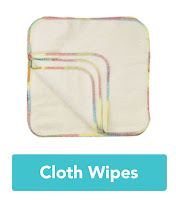 The waterproof back pocket is perfect for clothes, and the front pocket can hold wipes to clean up any messes, toilet seat covers, or any other potty accessories. Large Snack Bag: As little ones progress, accidents get less frequent and smaller, so you may not need to bring a full change of clothes. Keep extra underpants in a Large Snack Bag, which can then be used to carry the wet ones after changing. 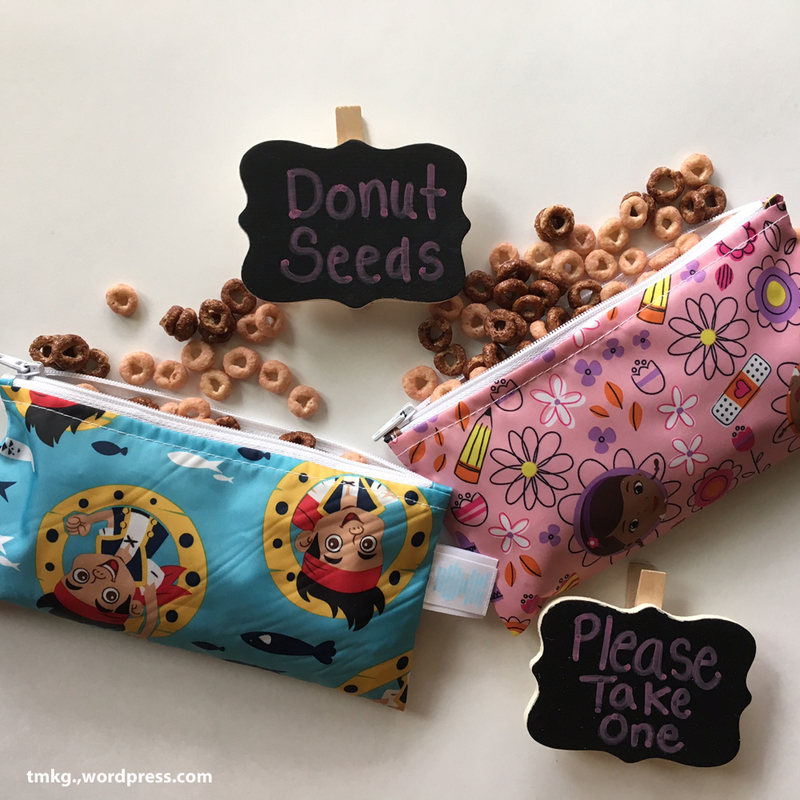 Small Snack Bag: Rewards can be the key in motivating some of the more stubborn children. Whatever forms of currency/bribery you use – M&Ms, lollipops, cookies, stickers – keep a stash at the ready in a Small Snack Bag. 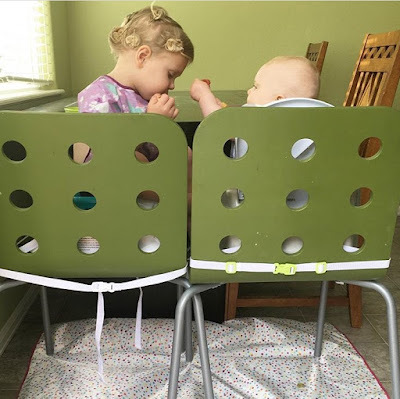 Splat Mat: Sometimes, little ones are so involved in whatever they are playing/watching/reading, they’ll wait too long to make a trip to the potty and an accident can occur. Have them sit on a Splat Mat while they’re focused on their fun and you’ll keep furniture and floors clean and dry. While some kids take to potty-training quickly, it can take a while for others. Don’t be discouraged! It can be hard to see the light at the end of the tunnel when you’re in the stall of a public restroom waiting for what seems like forever as your kid does anything but go potty, but know that you will, one day, be able to ditch the diaper bag and enjoy the freedom of a toilet-trained kiddo. Painting Fireworks for the 4th! With everyone in the patriotic spirit, Independence Day is a perfect time to craft with kids. Save your empty toilet paper rolls and grab some red, white, and blue paints to make fireworks the whole family can enjoy. Start by cutting strips into one end of the toilet paper rolls. The deeper the cuts, the bigger the firework blast. Pour red, white, and blue paint into separate paper bowls. Have kids dip the fanned out end of the toilet paper roll into the paint. Stamp the toilet paper roll onto a piece of paper. Tada! Fun and easy firework art for the holiday. Everyone told us when our first child was born that the time would fly by. They were right. Our three sons are now in fifth grade, first grade, and preschool. The last decade has brought my husband and me more mess, more noise, more laughter, more driving, more potty jokes, more sweetness, more struggle, more laundry, and more love than we ever imagined possible. We’re finally down to one five-point harness car-seat and one booster. No more cribs, diapers, highchairs, or strollers. Kid-induced sleep deprivation is no longer an issue. 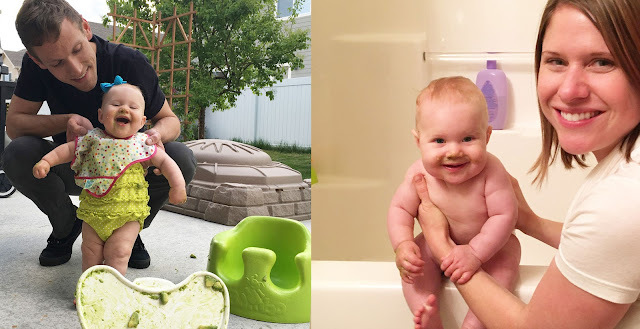 We used to spend many hours arguing over how to sleep-train: Ferber vs. Sears vs. Happiest Baby on the Block vs. Babywise…thankfully, we survived that stage (twice, with our first two kids…the third one loved to sleep, thankfully). My babydaddy and I still wake up too early and stay up too late, but now we can blame Netflix, HBO, and work. Every day I am grateful that I picked a great dad for my kids. On our first date, sixteen years ago, he charmed me with stories about his siblings and grandparents. So I knew right from the beginning that he was a family-oriented person. Since then, his actions have demonstrated his values. He prioritizes our family’s needs. He’s loving, honest, responsible, kind, a good sport, and very well-organized. He dresses better than me, and almost always knows pop culture references before I do. He’s super goofy, which people don’t really expect at first because he has very good manners. He’s good at explaining things, and making small talk. He’s good at being a friend and teaching our kids how to be a good friend to others. 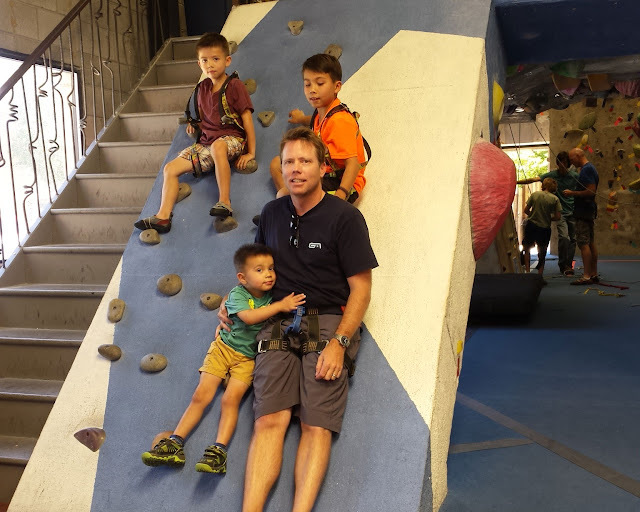 Our kids know that their dad is the expert on camping and hiking. He shows them how to fix things around the house. They know he’s the one to ask about art, architecture, how to organize their desk and what’s going on with just about every sport and playoff situation going on. He explains personal finance concepts, how to run a business, and stuff that’s related to our iPhones and computers. And “he doesn’t make us eat too many vegetables, like you,” said our six-year-old when I asked him to tell me his favorite thing about his dad. So this Father’s Day, the kids and I will be showing this very special guy how much we appreciate him with our usual festive traditions. We’ll make breakfast at home, which is very likely to include pancakes with berries and chocolate chips - a recent family favorite. There will definitely be bacon, since my husband loves bacon. Coffee and a green smoothie will also be on the menu (for us, not the kids). There will also be goofy cards and crafty homemade gifts. We always plan the day around doing a family activity, like a hike or a swim. For rainy or too-hot days, we’ve been known to visit to an art museum or an indoor rock climbing gym. Then we always head back home for some down time to relax. 1. Choose one of dad’s favorite recipes; keep it simple to assemble or prepare. 2. Shop for ingredients the day before to make the morning go smoothly. 3. Kids can help out too, by arranging fruit on a plate, pressing buttons on the blender for a smoothie, or setting the table. Playing “restaurant” and drawing a menu is fun for preschoolers. Avocado toast: Toast whole grain bread and spread sliced ripe avocado on it. You can also mix mashed avocado with a squirt of lemon juice and spread it. Add a sprinkle of salt and a dash of pepper. Top with a scrambled, soft-boiled, or fried egg. Eggs, hash browns & fruit: My kids love the task of cracking eggs into a bowl and beat them. Use frozen hash browns, or grate your own potatoes. Rinsing fruit is a fun task for toddlers. Crepes with Nutella and sliced bananas – Mix up the crepe batter and let it rest in the refrigerator overnight. Or buy crepes, ready-made, at the grocery store. Veggie and cheese omelette: Chop veggies the night before and let everyone pick which ones they want to include. Bagel with lox and cream cheese: Shop for these ingredients in advance. Add sliced tomatoes, cucumbers, onions, and capers. 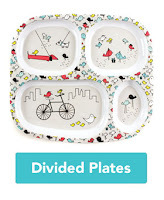 Arrange on a plate – voila! Breakfast sandwich – a scrambled egg and a slice of melted cheese on an English muffin is always a home run. Reaching Nova's 6 month "birthday" felt like a big milestone in our family. She has learned so much in the past few weeks- sitting unsupported, pulling herself to stand in her crib, first words and signs, and she is working really hard on crawling. As parents we have survived half a year of parenting two little ones. We decided to celebrate Nova's half birthday and the start of a new phase of her life. I made a cupcake out of pure avocado by filling a silicone cupcake liner with sliced and mashed avocado. Cut avocado in half. Slice one half and cut a couple slices into small segments to fit in the silicone cupcake liner. These slices will hold the candle in place. Reserve the other slices for your baby to explore. Scoop the flesh of the other half of avocado into a bowl and mash as desired. You can add a bit of water, breastmilk, or formula if you want to make it more creamy. Fill a Ziploc bag with the mashed avocado and snip the bottom corner off with scissors. 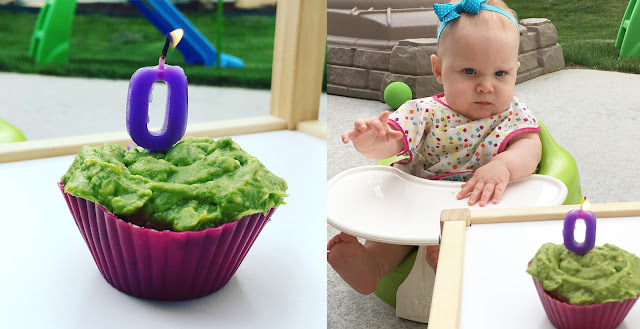 Pipe the mashed avocado into the cupcake liner to create a frosted look. Serve immediately to enjoy the pretty, fresh color! This recipe will work with a variety of first foods such as banana, sweet potato, or butternut squash. Be ready for a huge mess! We took the celebration out to our back porch and used our Bumbo Seat with the tray that way it could all be washed down after her meal. Our Bumkins Superbib saved a lot of cleaning and stains. 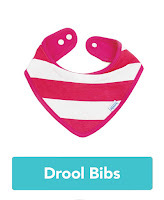 The thing I love about Superbibs is they can be washed a few different ways. If it’s not a major mess I wipe it down with a damp cloth. 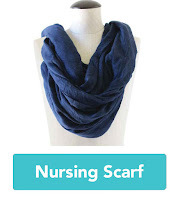 I also toss them in a sink of warm soapy water, rinse, and hang to dry. A few times per week I toss the Superbibs in the laundry with my kitchen towels and washcloths then hang to dry. Big sister Josie was very excited to be a part of the celebration and eagerly ran to Nova with a spoonful of avocado before we were ready! It was a lot of fun to watch Nova taste her cupcake and explore the texture. I did offer her a few bites of mashed avocado on a spoon but she was most interested in feeding herself the large slices I had set aside. Keep in mind that your baby’s first meal will probably only be a few bites. 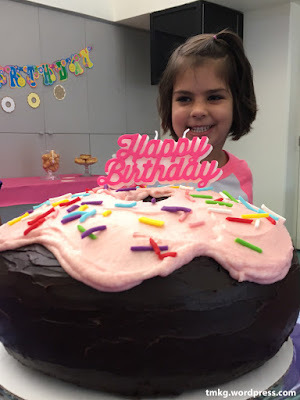 The prep for our celebration lasted longer than the time she spent eating but it was a lot of fun to share the experience as a family. 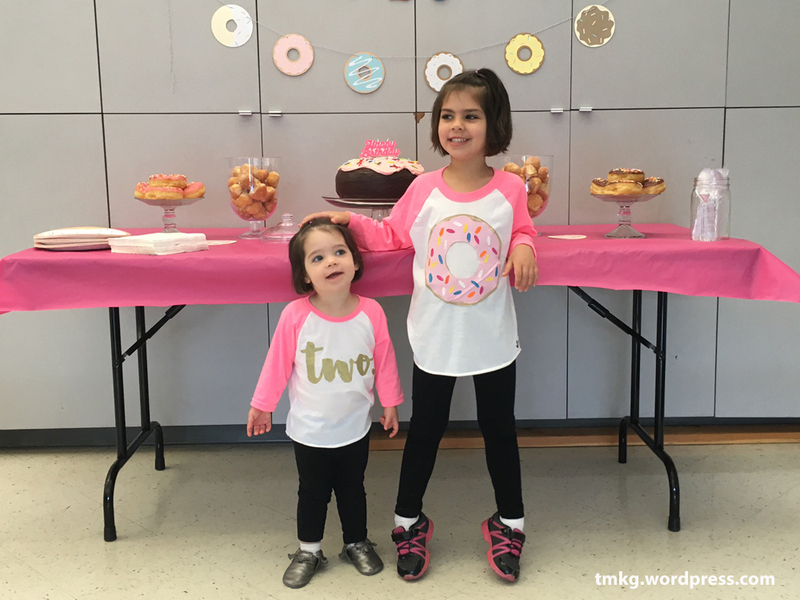 I am glad we have memories and photos to show the girls from Nova’s half birthday! Once Nova started showing she was done we hosed everything down... baby included! Disclosure: I received Bumkins product in exchange for this post. All opinions are mine. I’ve traveled quite a bit with my oldest daughter, who is almost 5, but a couple weeks ago we had the chance to take a trip – just the two of us – for the first time since her little sister was born. We flew from Phoenix to Reno for a wedding at Lake Tahoe. 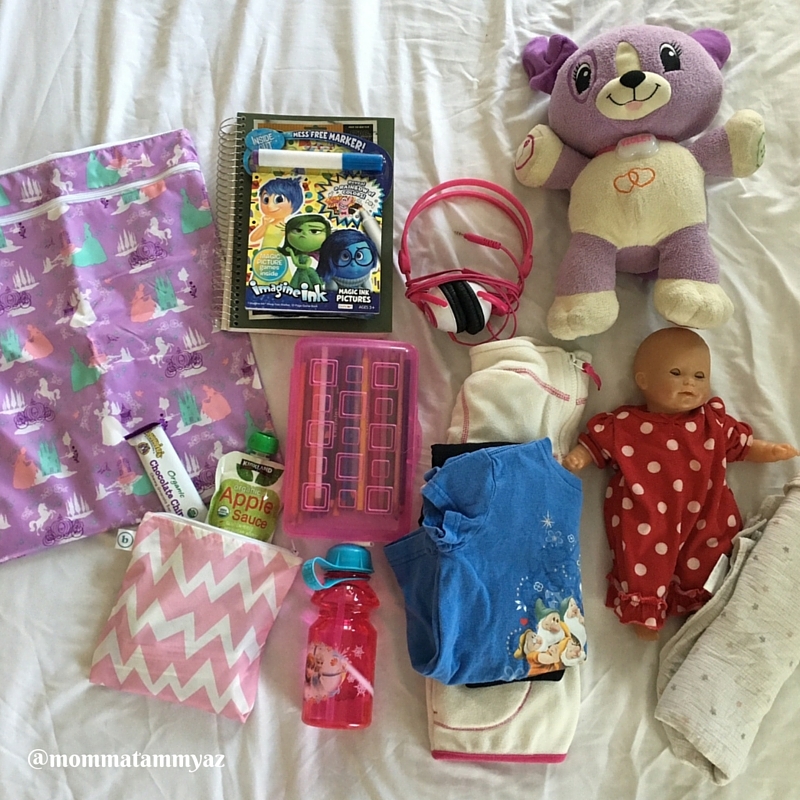 Packing for a three-day-weekend with a soon-to-be kindergartener is much lighter than packing for a trip with a baby or a toddler, but there are still some essentials I packed into her backpack (which, of course, I ended up carrying most of the time). My own carry-on list was a bit different. 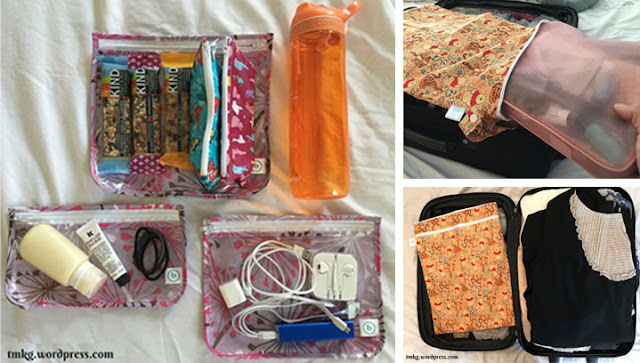 Using the three-pack set of clear travel bags from Bumkins, I packed the small bag with toiletry items: unscented lotion, lip balm, hair ties, etc. The medium bag I used for electronics: phone chargers, headphones, etc. 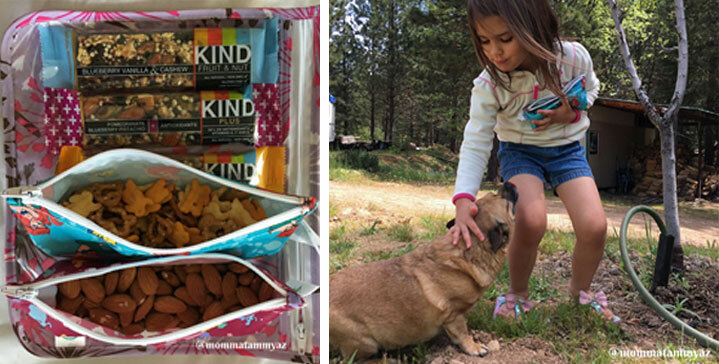 The large bag I used for snacks – it’s large enough to pack a few snack bars as well as some small Bumkins Snack Bags filled with other treats such as almonds and trail mix. Since it was a short trip, we shared a suitcase. At the last minute, we actually had to downsize the suitcase because there was a back-up with checked luggage at the airport and we had to carry everything on. The smaller suitcase meant I had to downsize my toiletry bag, so I pulled out just the inside insert and slipped it into a Bumkins Wet Bag in case any liquid items leaked on the flight. (Tip: Don't completely fill any containers with liquid items; leave room for expansion.) We luckily had no leaks and used the wet bag as a laundry bag for the remainder of the trip. The trip was quick one, but we had a great time visiting family and going to the wedding. 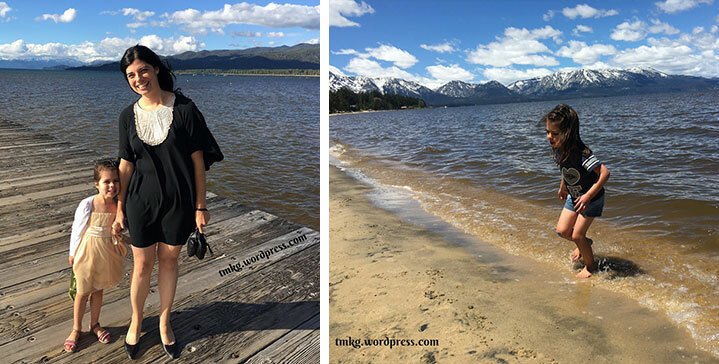 My daughter enjoyed splashing around in Lake Tahoe just before we left for the airport, so the change of clothes and wet bag in her backpack worked out perfectly! We turned one of Cadyn’s favorite lunch in to a super sweet brunch: peanut butter banana french toast. In a small bowl, lightly beat the egg. Spread 1 tablespoon of peanut butter on top of each slice of bread. Place the banana slices on top of one of the slices of bread. Place the other slice of bread on top of the first, to make a peanut butter and banana sandwich. In a skillet, melt the butter over medium heat. Dip the sandwich into the egg mixture and place in the heated skillet. Cook until brown on both sides. Serve hot. Finding a single delicious and healthy meal that works for every single person in the family can be a challenge. One of our kids recently announced he’s not eating pot stickers anymore because he’s tired of them. Another one isn’t eating cheese. The third one tends to change his mind daily about which vegetables and which types of meats he’ll eat. The “build your own dinner” approach promotes a family culture of healthy eating. Nutrition guru Ellyn Satter, Registered Dietitian and author of Child of Mine, Feeding with Love and Good Sense, advocates for a “division of responsibility in feeding” between the parent and the child. In this model, the parent’s job is to offer a variety of nutritious foods, provide guidance on where and when meals should take place, and promote a peaceful attitude about eating. The child’s job is to decide whether they want to eat and how much to eat. Building their own dinner encourages the child to eat what they made. Try these “build your own” meal ideas; feel free to customize the options for your crew! Burger Buffet: Set out the burgers, buns, sliced cheese, slices of tomatoes and onions, and lettuce leaves. Condiment possibilities could include ketchup, mustard, mayonnaise, and pickles…and try offering barbecue sauce and Sriracha too. Turkey, bison, or veggie burgers are lean protein choices. Pizza Party: Did you know that pizza is the most popular school lunch meal? Buy (or make) small personal-size pizza crusts, or use English muffins or flatbreads. Possibilities for toppings include marinara sauce, pesto, shredded mozzarella cheese, ricotta cheese, grated parmesan, roasted vegetables, fresh arugula, fresh basil, pepperoni, and slices of prosciutto. Taco Tuesday (or any day ending in “y”): Tacos are a great way to use up leftover rotisserie chicken, pork chops or fish. Or, try using lean ground turkey or lowfat refried beans. 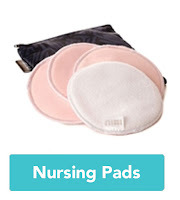 You could provide a choice between hard taco shells or soft 6-inch tortillas. To round out the taco fiesta, add bowls of shredded lettuce, chopped tomatoes, fresh cilantro, shredded cheese, chopped avocado, and pico de gallo. Don’t forget the hot sauce! Pasta Night: Steamed and sauteed veggies, chopped in bite-size pieces, are appealing additions to pasta. Protein options might include bite sized pieces of chicken or other meats, tofu, or edamame. Sauce options could include a marinara sauce, a pesto, a meat sauce or an alfredo sauce. Offering a sesame-peanut butter sauce would please family members who are in the mood for Asian flavors instead. Put out two kinds of noodles so that everyone gets to choose between bowties or penne, elbows or fettuccine, or whatever you wish. Make the pasta in advance and toss it with a little olive oil to prevent sticking. Baked Potato Bar: Bake the potatoes in advance, or, in a pinch, microwave them. Set out chopped green onions, sour cream (try a light sour cream, or mix plain nonfat Greek yogurt with sour cream to lighten it up), and shredded cheese. Non-traditional toppings could include turkey or bean chili, steamed vegetables, and any leftovers. • Prep ingredients ahead of time and keep them in the fridge, ready to be pulled out on a busy weeknight. • Keep portion sizes kid-friendly. • Don’t stress about providing too many choices; the younger the child, the fewer the options! Earth Day makes people reflect on their impact on the environment. What are they doing right? What could they do better? You don't have to make huge changes to make a difference. There are little steps you can take that will add up over time, and Bumkins is here to help! Check out the following tips below for some easy ways to make your life a little "greener." Carry your lunch in a lunch box or a reusable snack bag. Try a reusable container for your drinks. 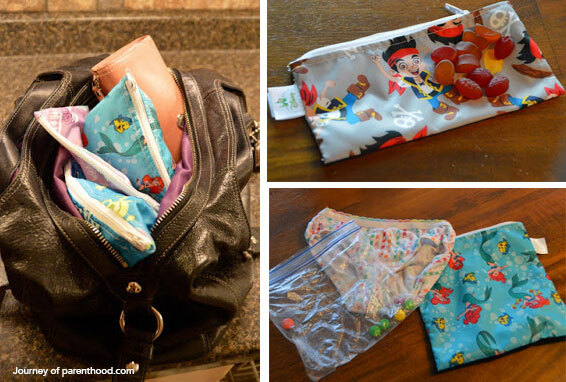 Use reusable snack bags instead of plastic bags. Use reusable forks, spoons and knives or wash plasticware and use it again. Buy food items in bulk and make individual servings using reusable containers. Get fun cloth napkins to wash and reuse. Bring a thermos or coffee mug from home to the cafe instead of using disposable cups. Pack toiletries in reusable travel bags instead of disposable plastic bags. Bring a reusable water bottle and refill from water fountains instead of buying individual bottles. Bring reusable wet/dry bags for soiled clothes, spill-able bottles and a tote bag for groceries. Don't buy travel sized items, dispense product from full-sized bottles into small reusable containers like these. Turn off — and unplug! — lights and electronics while you're away. Turn down the thermostat. Suspend newspaper delivery and mail services. Use rags or hand towels instead of paper towels or napkins. Use art smocks and bibs that can be washed and reused to protect clothing. Cut your shower time by 20% or take one fewer shower per week. Buy locally sourced food when possible, instead of . 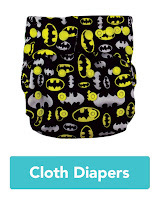 Cloth diaper your baby! The Union of Concerned Scientists has estimated about 18 billion diapers are thrown into landfills every year. When crafting, use reusable splat mats instead of disposable tablecloths or newspaper to protect tables and floors. Minimize toilet flushing—“if it's yellow, it's mellow, if it's brown, flush it down." Replace your light bulbs with CFLs or LEDs, which use less energy. Avoid using the clothes dryer by hanging your clothes out to dry whenever possible. Turn off—and unplug!—lights and electronics while you're away. Donate unused items to thrift organizations and shop at thrift stores to buy gently used items instead of new. Have Plastic Bags to Recycle? Visit PlasticFilmRecycling.org, enter your ZIP code into the search tool, and it will find the nearest place to take any unwanted plastic bags. You can also use 1800Recycling’s recycling search tool to find your closest plastic film recycler. Five years ago, when I was pregnant with Pumpkin and the ink on my master’s degree in environmental journalism was still wet, I tried to convince my husband we should use cloth diapers. He was not in favor and, because he would be staying home with her two days a week, I didn’t push it. Two years later and pregnant with Peanut, I still wanted to give them a try. My reasons for using cloth had to do with the environment (billions of diapers go to the landfill each year) and baby’s health (cloth can be better for skin because they don’t have the same chemicals for absorbency, perfumes or dyes). But the way I convinced my husband to at least learn about it was the cost savings. Peanut in her cloth diapers. We went to a class at Zoolikins, a local natural parenting store, where we learned a bit more about the different kinds of diapers, how they work, how to wash them, etc. It all seemed doable. And while there was an investment up front, it would definitely save us money over the long run, considering we were spending at least $50 a month on diapers for Pumpkin. The Bumkins Snap-In-One cloth diapers looked really big on my tiny little Peanut, especially at first, but it wasn’t really a big deal. As we grew used to seeing the cloth, and she got bigger, we didn’t notice anymore. Plus, the snaps on the diapers allowed us to adjust as she grew. The laundry routine was new for us, but we got into a habit of washing them every other night and hanging them to dry before we went to bed so they were ready to go in the morning. In the summer, especially, this was easy. In the winter, we’d sometimes need to put them in the dryer for a few minutes in the morning before packing the bag for daycare. We kept a wet bag in her bag for school for dirty diapers, plus one in the diaper bag in my car, and a large one in her bedroom. (Every day care we toured was on board with cloth, so that also helped make the decision easy.) Once Peanut started eating solids, we put a cloth diaper sprayer in the girls’ bathroom and added a wet bag there so we wouldn’t have to transport the diapers after rinsing them. The laundry routine stayed the same. New niece in her new cloth diaper. For a few reasons, including Peanut being close to potty training, we stopped using cloth not long before her second birthday. I’m glad we were able to keep it up that long, and the timing worked out nicely: my sister had her first baby in February and we were able to share many of our diapers that were in good condition. She also requested that I help teach her how to use them when I came to visit about two weeks after the baby was born. In addition to some hand-me-downs, I brought a few new items that were either favorites of mine or things I wanted but never bought myself: a soft, bamboo nursing cover that doubled as a scarf, a couple new diapers, cloth wipes (we keep these in the changing table and in the kitchen for cleaning faces and hands after meals), bandana bibs for drool and spit up, and washable nursing pads. I know cloth diapering seems intimidating, but the experience for us was a good one. The only thing I would change would be to have started with Pumpkin. Changing up a routine while also adding a second baby is a little more difficult than it probably would have been if we’d done it from the beginning! I didn’t try to convince my sister, but I’m glad she chose the cloth route, too. Nova is almost ready to enter a new phase of babyhood—eating solids! There is so much information about starting solids that it can easily become overwhelming. With our first baby, I did a lot of reading and researching, and I had a checklist of questions for the pediatrician and my breastfeeding support group. That was only 2 years ago, so it’s still fresh on my mind! After all of that preparing, the introduction of baby food was over in the blink of an eye. I’m very thankful to have a pediatrician who takes the time to bounce around ideas about feeding. Also, since Nova has a sensitive belly, I am meeting with a nutritionist who is also a lactation consultant. While breastfeeding, I have pinpointed several food sensitivities for Nova including dairy, soy, wheat, tree nuts, and peanuts. The food sensitivities are a new challenge for me since my first baby did not have any issues with the food I ate. I have decided to wait to start solids until Nova is around 6 months old and sitting unsupported. 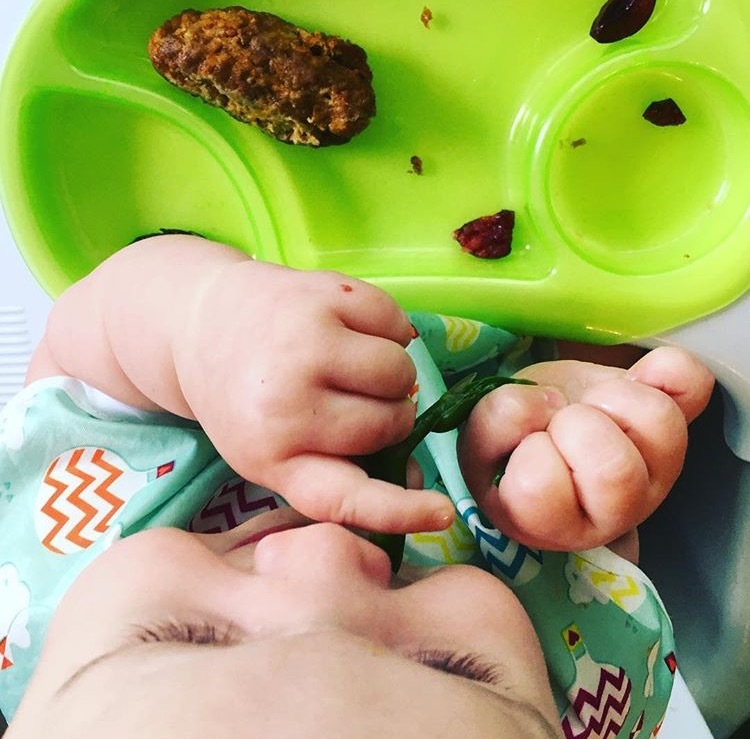 There are 3 different styles of feeding that I will experiment with when we start solids: purées, finger foods, and baby-led weaning (BLW). One thing I’ve learned since I became a mom is that it’s good to make a plan, but be willing to change it! With Nova, I plan to try a little bit of purées and finger foods and see how she does. We will see what she likes, identify her style and preference, and go from there. Maybe it will be 100% purées or a mix of two styles. I’m thinking it will be a little bit of each style. It will be so fun to see her learning and experimenting! Purées: I don’t think you need any kind of special baby food making machine to make purées. If you have a good blender or food processor, or just a fork you can do purees easily. The stage of feeding baby food purées is so short that I don’t want to purchase another kitchen appliance that will sit in the cupboard unused afterwards. Start with a simple age-appropriate fruit or veggie, and blend it while adding breast milk, formula, or water until it is soupy and thin. The food should pour off of the spoon like a liquid. If it is so thick that it sticks to the spoon it might cause choking or constipation at this age. Some great first fruits or veggies are avocado, sweet potato, banana, pear, apples, or butternut squash. I like to bake the sweet potato and squash, and steam the apple to soften before puréeing. If you want to try mashing the food with a fork, you will notice it is more textured, which is great once your baby has a little more experience. Not sure how thick to make your purées? Check out this video to see the consistency foods should be when it's mashed versus blended. Finger Foods: Small diced fruits and veggies can be served for Baby to self-feed and get a great sensory experience, while learning about their food. Be sure that the food is very soft and you can easily squish it between two fingers the way that their little gums will mash the food. Teeth are not required for finger foods because babies learn to mash with their gums before they ever get molars. I tend to dice the food to about the same size of a baby puff snack or Cheerio. 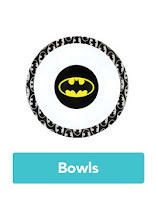 It’s small enough to pick up with their tiny fingers, but it’s not too big or firm to be a choking hazard. Follow your baby’s lead and interest! 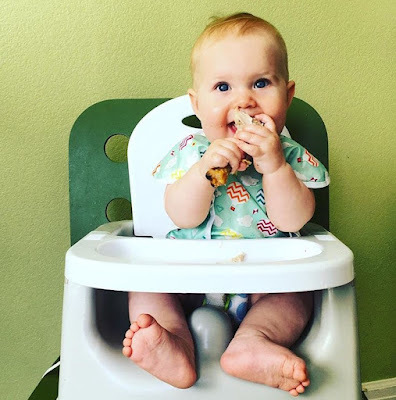 Baby Led Weaning: Offering whole foods in their purest form, with no purées or dicing, is the idea behind baby led weaning. This approach is said to help baby have better eye-hand coordination, learn about their food, self-feed, and regulate how much they eat. You can try offering a large slice of avocado, a half of a banana with the peel as a handle to grip, or large slices of baked sweet potato. At first, your baby might not eat a lot of the food you prepare, but that’s okay! Breast milk or formula should be the main source of nutrition until they are one year old, unless otherwise instructed by your pediatrician. Follow your baby and do what feels right when you are deciding how to introduce solids. There are many different styles and you’re sure to find one that works best for your baby. “Souping” is officially a verb, as in “souping is the new juicing.” Once humble, now decidedly posh, a diet of soup alone has ascended the hierarchy of nutrition trendiness to the point where, as the New York Times reported, there are competing soup cleanse delivery services and cookbooks. Savory soups loaded with vegetables and flavored with herbs and spices are finally getting the attention they deserve, but breakfast smoothie bowls made with yogurt or milk and topped with fruit and granola are a different kind of “soup” that’s popular too. As a Registered Dietitian as well as a minivan mom of three, I am delighted that nutritious, delicious soup is in the wellness spotlight. (Plus, I always like to think I am tuned into the zeitgeist, even though I left Williamsburg, Brooklyn, and moved to Phoenix 11 years ago.) I’ve been a fan of soup for years; after all, soups are comforting, hydrating, and there are a million different types to suit your fancy. Whether they’re sweet or savory, warm or cool, broth-based and chunky or pureed to a creamy texture, soups can be tailored for everyone in the family. One of my favorite things about eating soup at home is that it’s easy to dish out quickly, so everyone gets to sit and eat together immediately. 1. Nutritious - Soup is an ideal way to add nutrient-rich plant foods into our diets. Vitamins and minerals stay in the saucepot and end up in our bowls. Cooking vegetables softens the fibers and increases absorption of certain nutrients; for example, the heart-healthy antioxidant lycopene in cooked tomatoes is more easily absorbed than lycopene in raw tomatoes. In a pinch, use frozen and canned vegetables, too. (Rinse canned vegetables to remove extra sodium.) Protein-rich beans, lentils, edamame and quinoa are vegetarian-friendly additions that contribute both protein and fiber. Mix in brown rice and whole grain pasta for a heartier dish. Lean meats, poultry and fish can be added too. Garnishing your soup with fresh chopped parsley, basil, or dill adds extra flavor and immunity-boosting power. 2. Flexible - There are so many soup recipes that can be adapted to accommodate food allergies, seasonality of local foods, and dietary preferences. Texture can be adjusted to meet developmental needs and sensory issues. Adding more chicken or vegetable broth easily thins out a soup. A one-year-old who’s still learning to eat with a spoon may find thin liquids challenging, so a thicker soup that’s the consistency of applesauce or yogurt may be easier to manage. To thicken, try adding a few teaspoons of oat flour or a slurry made from flour or cornstarch mixed with broth. Use local and in-season vegetables for peak flavor. During hot weather, try serving cool melon soups, breakfast smoothie bowls, and gazpacho. 3. Introduces new flavors– Every cuisine around the world has their soup specialties, so trying new recipes is a great way to introduce new flavor profiles to young taste buds. Italian minestrone, Chinese hot and sour soup, Japanese miso soup, Mexican albondigas, Ukrainian borscht, Indian mulligatawny soup, Spanish gazpacho, and Thai coconut curry soup are zesty gateways to international cuisines. 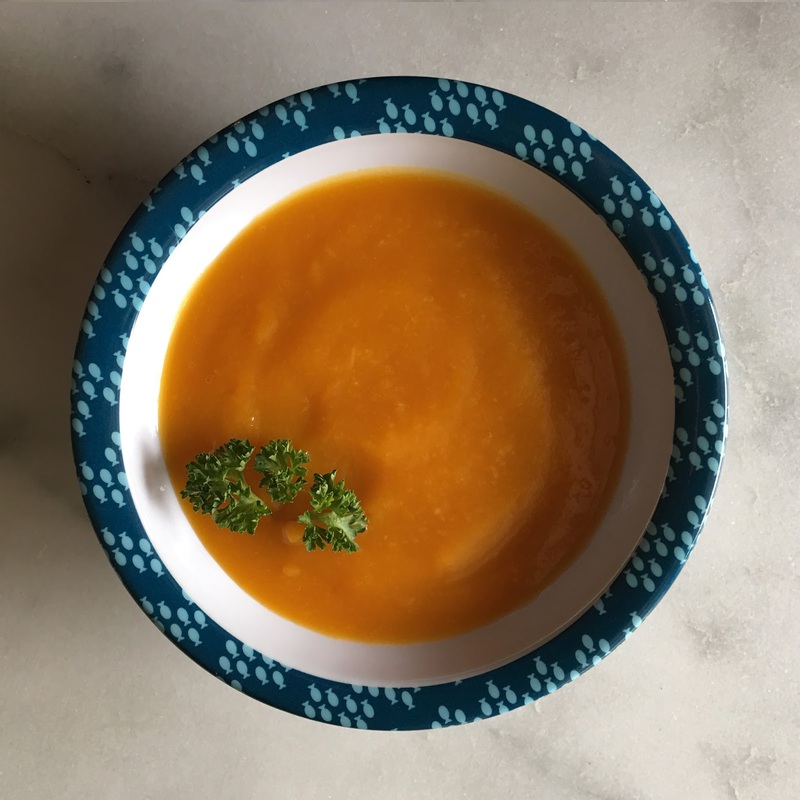 For your very youngest soup-eaters, try adding a sprinkle of cinnamon or ginger to puréed butternut squash or sautéing lentils with a bit of coconut oil, garlic and onions before blending them to a creamy consistency. 4. 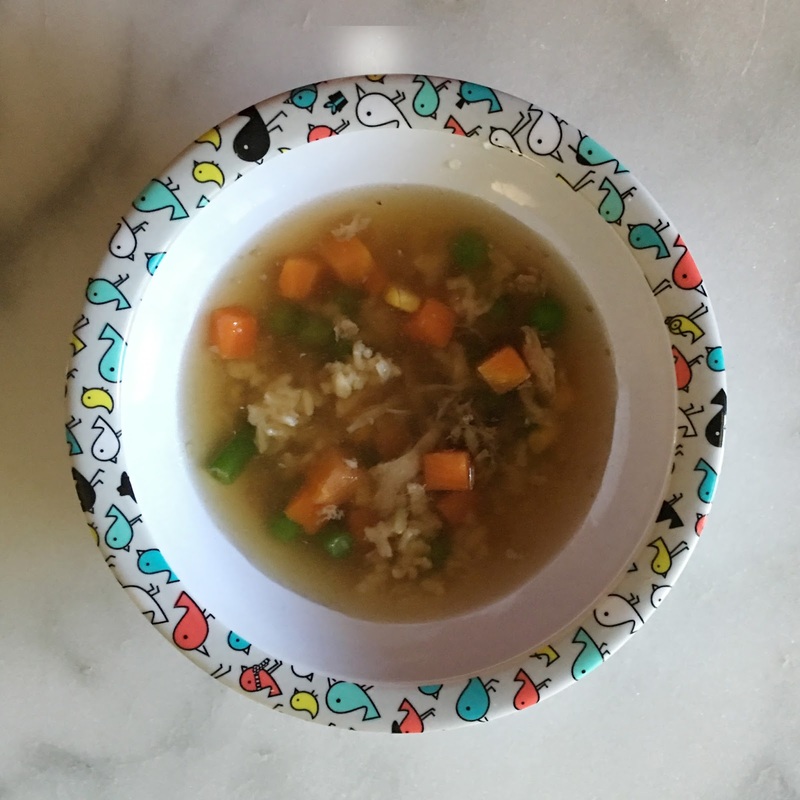 Kid-friendly kitchen duties –Invite your little one to be your soup sous chef. Offer them the opportunity to help out with one – or more – of the simple cooking steps involved in the recipe. Preschoolers can rinse broccoli in a bowl full of water in the sink, strip kale leaves from the stems, and push buttons on an immersion or countertop blender to purée a soup. Elementary school-aged kids can peel carrots, scrub potatoes, grate cheese, and use a knife to chop onions, celery, and fresh herbs. 5. Time-saver - For especially busy days, soups can be made ahead of time and reheated right before serving. Try making a double batch and then freezing extras in small, easy-to-reheat portions. To save time prepping ingredients, use frozen, canned, and pre-cut vegetables. A variety of chopped vegetables is available in the grocery store, such as onions, garlic, and butternut squash. When you know you’ll be away all day, combine ingredients in a slow cooker in the morning and let your soup simmer to perfection so that you come home to a one-dish meal that’s ready to eat. And sometimes, there just isn’t time for cooking. There are so many wonderful soups available in the grocery store that would make excellent back-up meals. Look for low-sodium versions when possible. You can also use store-bought soups or even combine a store-bought broth with a jar of pasta sauce as the base for a soup. 2. Slice a 2 lb. butternut squash in half lengthwise, and place the halves, cut side down, in a large baking dish with enough water to fill the dish about an inch high. 3. Bake the squash for 45 minutes, until soft. 5. Add the chicken or vegetable broth and the grated ginger to the squash in the bowl. 6. Use an immersion blender to puree the broth, ginger, and the squash until creamy. You can leave it as chunky as you wish. Add more broth for a thinner consistency. 1. Heat the broth on low-medium in a pot on the stove. 2. Add the frozen mixed vegetables to the broth and let them cook for 3-5 minutes. 3. Add the turkey and brown rice. 4. Stir in the soy sauce. 5. Add sliced green onions for garnish, if desired. Berries – but use whatever is in season! Sliced bananas and frozen berries shine here. 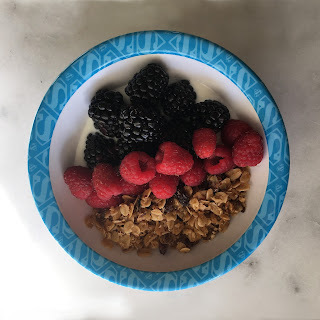 Homemade granola: it’s sweetened already, but you can drizzle with a little honey if you want. 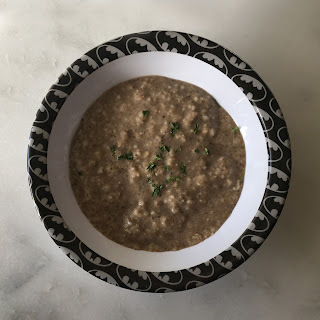 This Creamy Mushroom Soup is one of our family’s recent favorite soups. It’s incredibly savory due to the umami-rich mushrooms.